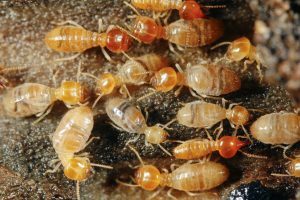 Unlike many of the creepy crawlies seen on Long Island, the sight of termites in you home can mean more than just some gross bugs in your home, it could mean your home has a termite infestation. This type of infestation is especially unnerving due to the fact that termites can actually cause substantial damage to a home. Termites are insects of the order Blattodea. This means they are closely related to another pest, the cockroach. Termites survive in colonies similar to that of ants and have a caste system that includes a king, queen, and then workers and soldiers. Termites are considered detrivores which mean they consume dead plant materials. In this lies the major problem of termites. Dead plant materials, unfortunately, includes many materials that make up your home. Which is why termites will often be found taking up residence where they are unwanted. Houses are typically more comfortable for insects such as a termite as they are not the only temperature controlled but also contain no predators. Here at Twin Forks Pest control, we have a vast understanding of termites and termite behavior. We understand that to truly eliminate termites and keep your home safe the queen must be exterminated. The measures we take in termite extermination will get eliminate the termite presence in your home and prevent them from returning. 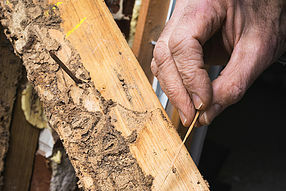 If left untreated, Termites can wreak havoc on a home. This is because termites actually eat wood that can be found in the structural beams, window sills, and other areas of a home. Unfortunately, termites often eat wood that is an integral part of keeping a home standing strong. It is estimated that subterranean termites cause over a billion dollars in damage to United States homes each year. Unlike fires, hurricanes, and tornadoes, termite damage is usually not covered by your homeowner insurance policy. Therefore, if you suspect that your home might be infested with termites, getting your home inspected and treated will save you money in the long term. It’s much more manageable to catch termite damage early on in an infestation. Are you in need of termite treatment on the East End of Long Island? Twin Forks Pest Control has been the authority for termite control and treatment for years and we’re ready to help you. At Twin Forks Pest Control, we advise getting your home inspected every year for the peace of mind that your home is termite free. One of our termite experts will help with termite prevention to avoid any future infestations. If termites are spotted, we will help with removal and extermination until your home is termite free. For more information about our termite inspection services give us a call at any of our regional numbers or fill out our contact form.